Virginia Caves Are Protected By Law! 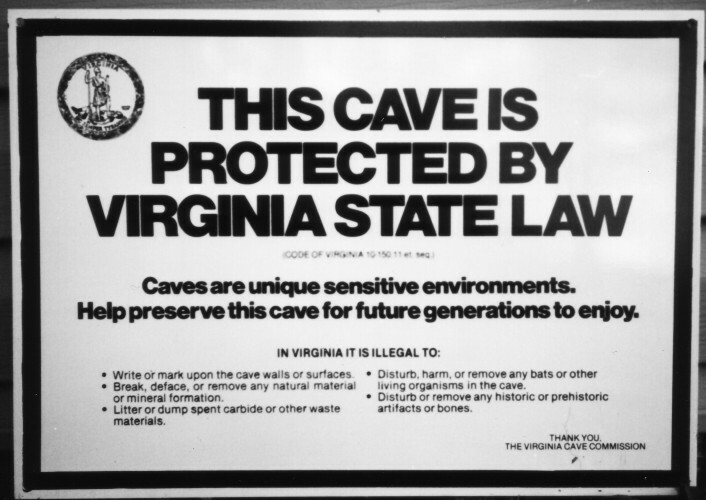 The Virginia Cave Law protects caves from vandalism or any other destructive practices. It specifically prohibits the destruction or defacement of cave formations and/or the disturbance or removal of cave minerals and biota. "Board" means the Cave Board. "Cave" means any naturally occurring void, cavity, recess, or system of interconnecting passages beneath the surface of the earth or within a cliff or ledge including natural subsurface water and drainage systems, but not including any mine, tunnel, aqueduct, or other man-made excavation, which is large enough to permit a person to enter. The word "cave" includes or is synonymous with cavern, sinkhole, natural pit, grotto, and rock shelter. "Cave life" means any rare or endangered animal or other life form which normally occurs in, uses, visits, or inhabits any cave or subterranean water system. "Commercial cave" means any cave utilized by the owner for the purposes of exhibition to the general public as a profit or nonprofit enterprise, wherein a fee is collected for entry. "Gate" means any structure or device located to limit or prohibit access or entry to any cave. "Material" means all or any part of any archaeological, paleontological, biological, or historical item including, but not limited to, any petroglyph, pictograph, basketry, human remains, tool, beads, pottery, projectile point, remains of historical mining activity or any other occupation found in any cave. "Owner" means a person who owns title to land where a cave is located, including a person who owns title to a leasehold estate in such land, and including the Commonwealth and any of its agencies, departments, boards, bureaus, commissions, or authorities, as well as counties, municipalities, and other political subdivisions of the Commonwealth. "Person" means any individual, partnership, firm, association, trust, or corporation or other legal entity. "Sinkhole" means a closed topographic depression or basin, generally draining underground, including, but not restricted to, a doline, uvala, blind valley, or sink. "Speleogen" means an erosional feature of the cave boundary and includes or is synonymous with anastomoses, scallops, rills, flutes, spongework, and pendants. "Speleothem" means a natural mineral formation or deposit occurring in a cave. This includes or is synonymous with stalagmite, stalactite, helectite, shield, anthodite, gypsum flower and needle, angel's hair, soda straw, drapery, bacon, cave pearl, popcorn (coral), rimstone dam, column, palette, flowstone, et cetera. Speleothems are commonly composed of calcite, epsomite, gypsum, aragonite, celestite, and other similar minerals. A. The Cave Board is continued within the Department of Conservation and Recreation and shall consist of the Director of the Department of Historic Resources, or his designee, serving in an ex officio capacity and eleven citizens of Virginia appointed by the Governor for four-year terms. Appointments shall be made on the basis of activity and knowledge in the conservation, exploration, study and management of caves. B. The Cave Board shall meet at least three times a year. Six members shall constitute a quorum for the transaction of business. The Board shall annually elect a chairman, vice-chairman and recording secretary and such other officers as the Board deems necessary. 1. Accept any gift, money, security or other source of funding and expend such funds to effectuate the purposes of this chapter. 2. Serve as an advisory board to any requesting state agency on matters relating to caves and karst. 3. Conduct and maintain an inventory of publicly owned caves in Virginia. 4. Provide cave management expertise and service to requesting public agencies and cave owners. 5. Maintain a current list of all significant caves in Virginia and report any real and present danger to such caves. 6. Provide cave data for use by state and other governmental agencies. 7. Publish or assist in publishing articles, pamphlets, brochures or books on caves and cave-related concerns. 8. Facilitate data gathering and research efforts on caves. 9. Advise civil defense authorities on the present and future use of Virginia caves in civil defense. 10. Advise on the need for and desirability of a state cave recreation plan. 11. Inform the public about the value of cave resources and the importance of preserving them for the citizens of the Commonwealth. 1. Protect the rare, unique and irreplaceable minerals and archaeological resources found in caves. 2. Protect and maintain cave life. 3. Protect the ground water flow which naturally occurs in caves from water pollution. 4. Protect the integrity of caves that have unique characteristics or are exemplary natural community types. 5. Make recommendations to interested state agencies concerning any proposed rule, regulation or administrative policy which directly affects the use and conservation of caves in this Commonwealth. 6. Study any matters of special concern relating to caves and karst. 1. Break, break off, crack, carve upon, write, burn, or otherwise mark upon, remove, or in any manner destroy, disturb, deface, mar, or harm the surfaces of any cave or any natural material which may be found therein, whether attached or broken, including speleothems, speleogens, and sedimentary deposits. The provisions of this section shall not prohibit minimal disturbance for scientific exploration. 2. Break, force, tamper with, or otherwise disturb a lock, gate, door, or other obstruction designed to control or prevent access to any cave, even though entrance thereto may not be gained. 3. Remove, deface, or tamper with a sign stating that a cave is posted or citing provisions of this chapter. 4. Excavate, remove, destroy, injure, deface, or in any manner disturb any burial grounds, historic or prehistoric resources, archaeological or paleontological site or any part thereof, including relics, inscriptions, saltpeter workings, fossils, bones, remains of historical human activity, or any other such features which may be found in any cave, except those caves owned by the Commonwealth or designated as Commonwealth archaeological sites or zones, and which are subject to the provisions of the Virginia Antiquities Act (§10.1-2300 et seq.). B. Entering or remaining in a cave which has not been posted by the owner shall not by itself constitute a violation of this section. C. Any violation of this section shall be punished as a Class 1 misdemeanor. D. The provisions of this section shall not apply to an owner of a cave on his own property. A. It shall be unlawful for any person, without express, prior, written permission of the owner, to store, dump, litter, dispose of or otherwise place any refuse, garbage, dead animals, sewage, or toxic substances harmful to cave life or humans, in any cave or sinkhole. It shall also be unlawful to burn within a cave or sinkhole any material which produces any smoke or gas which is harmful to any naturally occurring organism in any cave. B. Any violation of this section shall be punished as a Class 1 misdemeanor. A. It shall be unlawful to remove, kill, harm, or otherwise disturb any naturally occurring organisms within any cave, except for safety or health reasons; however, scientific collecting permits may be obtained from the Department. B. Any violation of this section shall be punished as a Class 3 misdemeanor. It shall be unlawful for any person to sell or offer for sale any speleothems in this Commonwealth, or to export them for sale outside the Commonwealth. Any violation of this section shall be punished as a Class 1 misdemeanor. Neither the owner of a cave nor his authorized agents acting within the scope of their authority are liable for injuries sustained by any person using the cave for recreational or scientific purposes if no charge has been made for the use of the cave, notwithstanding that an inquiry as to the experience or expertise of the individual seeking consent may have been made. Nothing in this section shall be construed to constitute a waiver of the sovereign immunity of the Commonwealth or any of its boards, departments, bureaus, or agencies.